Managed storage and databases to satisfy all your needs. Different applications and workloads require different storage and database solutions. We offer a full suite of industry-leading storage services that are price performant and meet your needs for structured, unstructured, transactional, and relational data. This page helps you identify the solutions that fit your scenarios, whether developing mobile applications, hosting commercial software, building data pipelines, or storing backups. Fully managed, price-performant block storage that is suitable for virtual machines and containers. A scalable, fully managed, highly reliable, and cost-efficient object / blob store. A scalable, fully managed NoSQL wide-column database that is suitable for both low-latency single-point lookups and precalculated analytics. A scalable, fully managed NoSQL document database for your web and mobile applications. 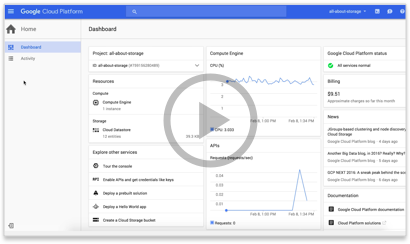 A fully managed MySQL and PostgreSQL database service that is built on the strength and reliability of Google's infrastructure. Mission-critical, relational database service with transactional consistency, global scale, and high availability. A scalable, fully managed enterprise data warehouse (EDW) with SQL and fast ad-hoc queries. A collaborative space for storing, sharing, and editing files. Mobile and web access to Cloud Storage with serverless third party authentication and authorization. A realtime NoSQL JSON database for your web and mobile applications. Production-grade web and mobile content hosting for developers. A NoSQL document database that simplifies storing, syncing, and querying data for mobile and web apps at global scale.